ANYANG, South Korea and SAN FRANCISCO, Feb. 4, 2019 /PRNewswire/ -- Vieworks, a global leader in machine vision, is presenting the newest Time Delay Integration (TDI) line scan cameras at Photonics West 2019 (Booth# 5648) in Moscone Centre in San Francisco. There will be 7 new cameras with resolutions of in 9k, 12k, 16k and 18k, with Camera Link and CoaXpress interface. Based on the novel and award-winning hybrid sensor technology from Vieworks, the new models will offer an ever-increasing performance and affordability in a market characterized until recently by expensive products. The new 7 price breaking models will enable many more applications in the machine vision market and reduce previous price limitations. Based on the world's first, proprietary hybrid sensor technology introduced by Vieworks, the new models expand an already large product lineup. Combining CCD and CMOS imaging technologies and integrating the best features from both, Vieworks has revolutionized the line scan market. The underling CMOS structure of the sensors enables high speed readout, eliminates the need of expensive and complex external circuitry and lowers the power consumption. By incorporating the CCD pixel array on top, the sensor keeps superior image quality from CCD in terms of signal to noise ratio and dynamic range. Additionally, the integration process of TDI camera does not add any noise because it involves the charge transfer. Since the introduction of these cutting-edge technology, more than 1,800 cameras are installed in the field worldwide for applications ranging from Flat Panel Display inspection to preservation of the data in Arctic World Archive. The new models will be available immediately. "Vieworks is leading the way in improving performance of line scan camera market in terms of high sensitivity and high speed," said Dohyun Park, Senior Product Engineer. 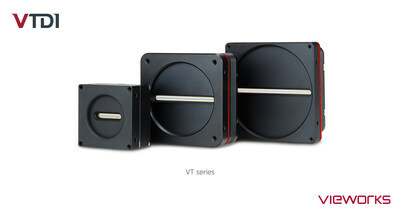 "We are thrilled to introduce the new VT models to give our customer more options. They represent Vieworks' continuing investment in pursuing customer benefits and will be another game changer in machine vision industry." With the state-of-the-art technology in optics design, Vieworks introduces a wide variety of unique and innovative industrial cameras to the machine vision industry. The offering includes unparalleled ultra-high-resolution cameras with up to 155 Megapixels based on proprietary Vieworks sensors. Some models include Thermoelectric Cooling Technology (TEC), allowing stable camera performance even in the high-temperature environment and pixel shift technology allowing to increase the resolution even more. Vieworks is also a creator of Time Delayed Integration (TDI) line scan cameras based on proprietary and advanced hybrid technology. Vieworks is committed to not only advancing ultra-high-resolution and fast camera technologies, but also breaking new grounds in innovative yet affordable vision applications. For more information, please visit www.vieworks.com.